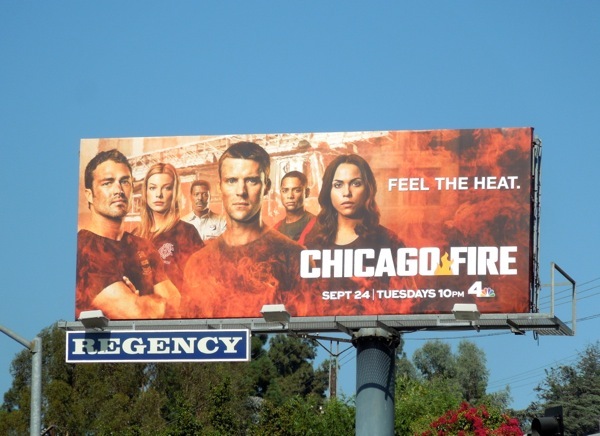 Yesterday it was cops with the revival of Ironside on NBC and today it's the turn of the firefighters in Chicago Fire returning for a scorching sophomore season. Are you ready for the heat to be turned up on the personal and professional lives of the hot young firemen and women and paramedics as they risk their lives on a daily basis? 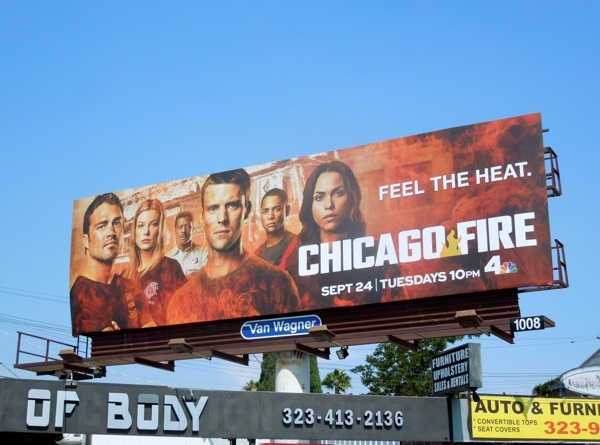 Criticised by some for regurgitating the usual firefighting stereotypes and plotlines, at least the cast are easy on the eye and stories entertaining and someone must be watching to warrant a second season. 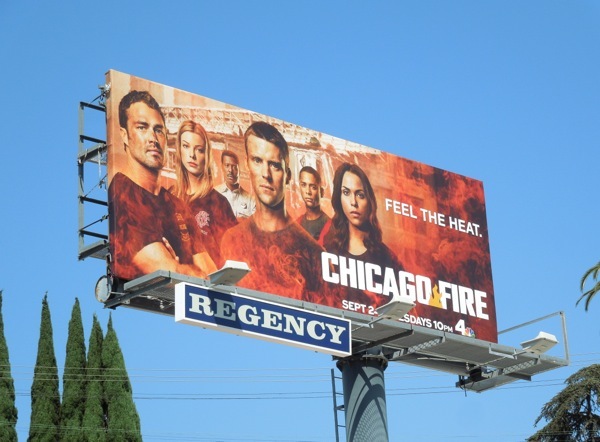 But most importantly, in the battle of the firefighting hunks, are you 'Team Severide' (played by Taylor Kinney on the far left) or 'Team Casey' (played by Jesse Spencer in center)? 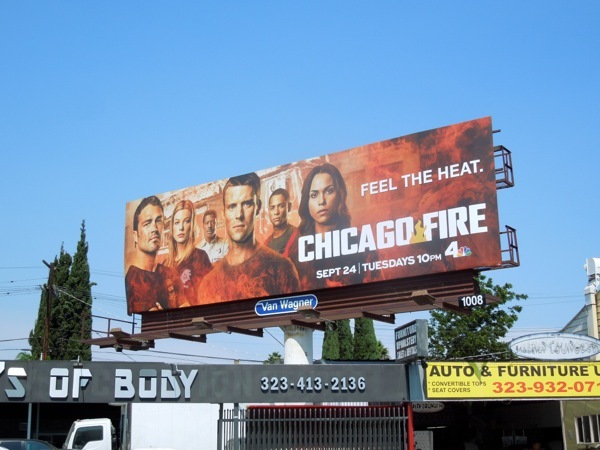 The smaller season two 'Feel the heat' ad was snapped along Sunset Boulevard, whilst the standard landscape version was spotted along Melrose Avenue on September 11, 2013. 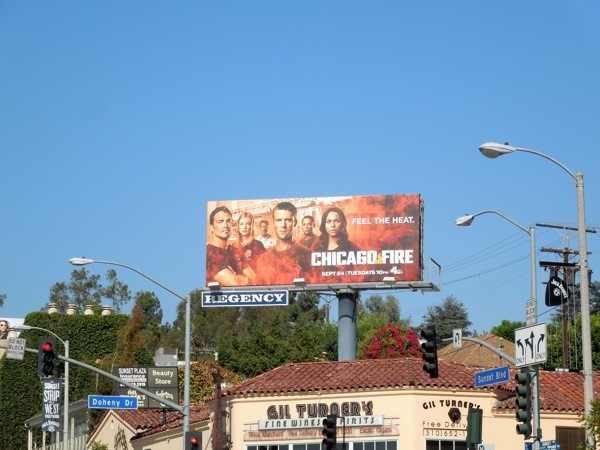 If you're a fan of the show, be sure to also check out these giant-sized billboards for the first season of Chicago Fire and more ads for the series from around the streets of L.A. from this time last year.